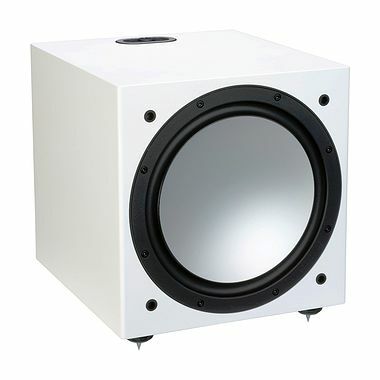 Monitor Audio Silver W-12 500w Subwoofer. Available with Online Finance and Free Delivery. The Monitor Audio Silver Series subwoofer delivers seismic bass right down to 22 Hz using a powerful, long throw 12-inch driver. The Silver W-12’s over-specified driver assembly employs a hugely powerful magnet system and massive voice coil to deliver immense power from the compact sealed cabinet. A heavy-duty diecast basket not only holds the massive system rigidly together, but also assists thermal sinking to keep the driver cool.